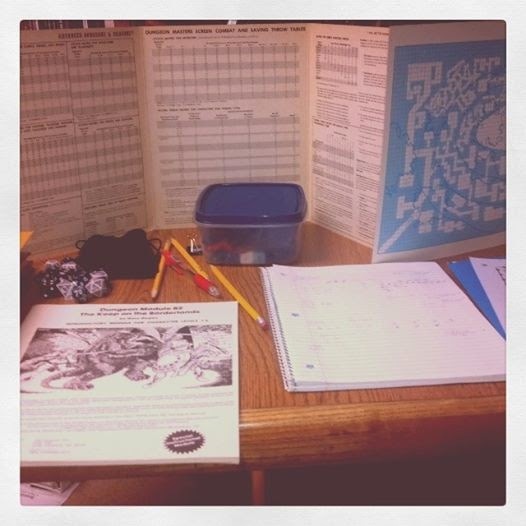 Had the chance to play some good old-school D&D with the boys yesterday. What was going to be a "pure" AD&D game is morphing more and more to an OSR kitchen sink game. The boys, along with their retainers the Cinco Hermanos managed to loot the Gnoll cave. 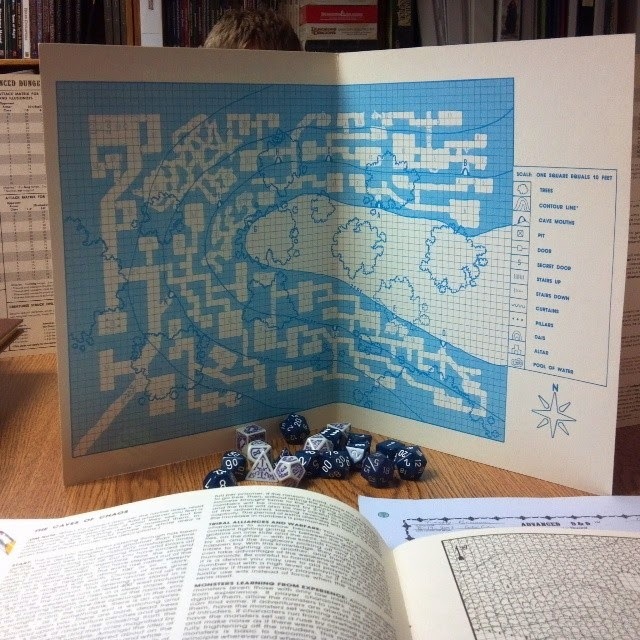 They found the secret door to the Caves of Evil Chaos (which in Basic D&D was redundant). The had found the helm of alignment change but figured it out right away. The attacked the evil priests and used the helm to turn one good. I mixed in elements of "Return to the Keep on the Borderands" and made the high priest a high priestess of Ereshkigal, who is one of the goddesses of the vampires. This is the first clue of the oncoming plot of the world being shrouded in darkness. The paladin of the group burned all the unholy books, but the do know there are plans for the humanoids to raid the Keep and then move on to more populated lands. While they still have part of the northern caves to cover, I am willing to call this one done. They stopped the evil cult and the monsters now will go back to fighting each other. I have to admit it was a really fun time going through this one again. Seeing those light blue maps does my heart good. Sounds like a lot of fun. I miss rolling real dice. Good stuff! I have some great memories of that module! Although I have actually ran B1 more than B2.